Readers, I think this will be my last festive bake of the year… an improvement on last though, when I only managed some peppermint chocolate bark on Christmas Eve. 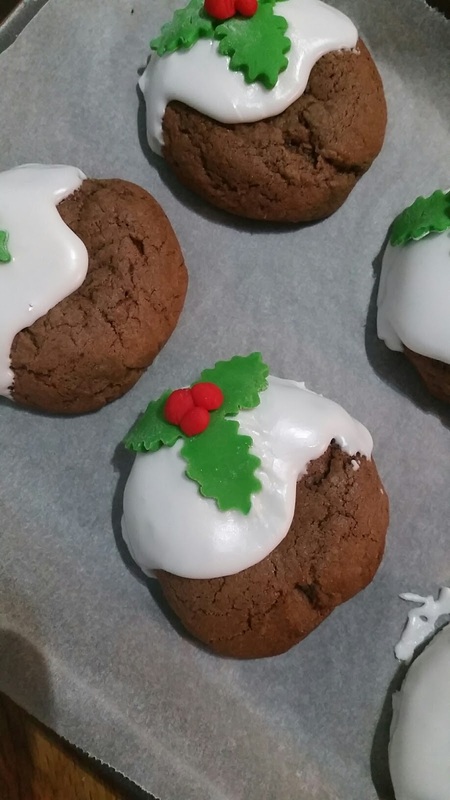 So far I’ve managed some gingerbread reindeers, chocolate star lollies and now, my latest creation the Christmas pudding cookie. I can’t take full credit – as I messed around with the recipe last week, I made holiday cookies and dipped half in royal icing then covered them in sprinkles. Mr WhatClaireBaked mentioned that they looked like Christmas puddings turned on their sides – it hadn’t even occurred to me that they could be puddings. So I vouched to try again this week and actually make puddings. 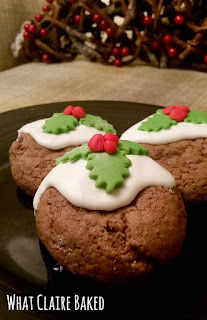 These are finished with really simple white royal icing and a fondant holly wreath. I used a Lakeland holly leaf cutter to make the leaf template then rolled little red berries to stick on. Helpful hint – when making the cookie dough, make sure to chill the finished dough for at least 40 minutes before putting the cookies into shapes and into the oven – it stops them from spreading out too thinly. A very Merry Christmas and thanks to all my readers for continuing to read and support my blog! Cream butter, caster sugar, brown sugar and vanilla extract until light and fluffy. Use an electric mixer if you have one. Beat eggs together in a separate bowl and gradually add to sugar and butter mix using electric mixer until fluffy. Add baking powder, cocoa powder and salt to the flour and sift into the eggs, sugar and butter. Fold together using a metal spoon. You should create a dough, once flour is folded in. Bring together into a ball. Transfer dough ball to a clean bowl and chill in the fridge for a minimum of 40 minutes, ideally an hour, until dough has firmed up. Whilst dough is chilling, preheat the oven to 190 degrees/ Fan 170 degrees/ Gas 4. 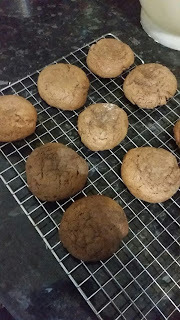 Cover baking trays with greaseproof paper. Remove dough from fridge and using your hands roll small balls of dough. Place onto baking sheets, spaced well apart (no more than 4 cookies per baking sheet). Bake for 8-10 minutes in the oven. Remove from oven, allow to cook on tray for a few moments to ensure cookies retain their shape. Transfer to a wire rack to finish cooling. Whilst cooling, make the royal icing by adding the whites of two large eggs to icing sugar. Using an electric mixer whisk up the icing until white, smooth and thickened. Cover with cling film until ready to use. 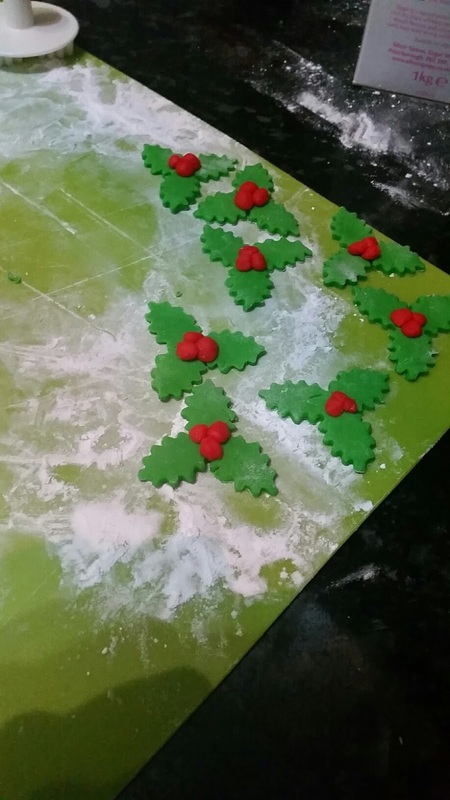 Make the fondant holly leaves and berries. 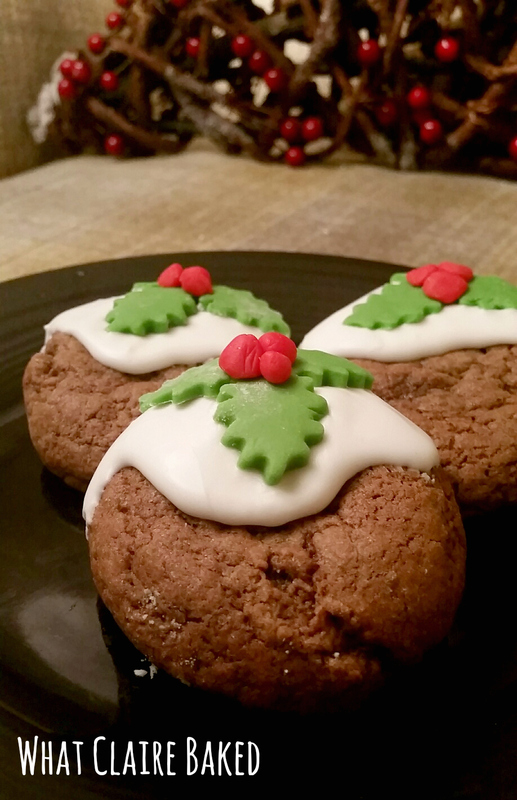 Once cooled, spoon icing over the top half of the cookie, like a Christmas pudding. Top with holly decoration and put in the fridge to set. Serve once icing has set, or alternatively store in an airtight container for up to 3 days.